Quinoa is one of the most versatile foods you can prepare, and it can be used in a myriad of ways to add a boost of nutrition and earthy goodness to any meal. Here we’ve broken it down for you by which meal of the day you’re having, whether you want something sweet, or if you want to go meatless, or just want something you can whip together in a few minutes. You might not see the word “porridge” being kicked around outside of Goldilocks and the Three Bears, but here’s a way to make a hearty porridge using a blend of ingredients that are all renowned for their healthy properties. Let’s start with our favorite, quinoa. This is going to make sure that your day starts off right with protein and fiber. 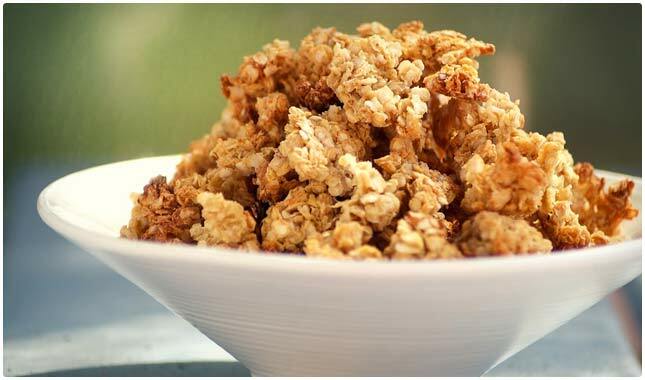 The oats add additional fiber and have a different texture, thickening things up. The flax seed is an excellent way to sneak in some omega-3s and you’re all set. Top with fruits like blackberries and apricots and you kick the flavor up a notch. We dare you to say this recipe name three times fast! 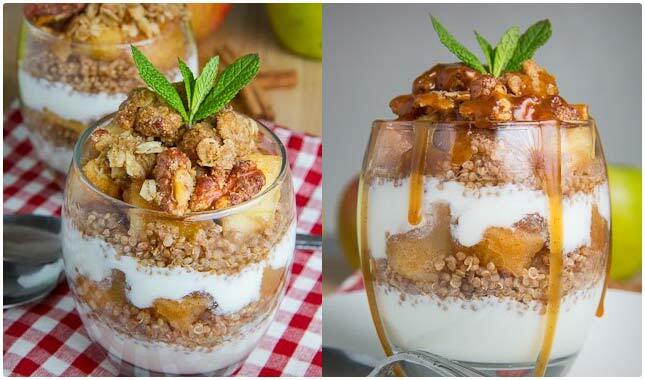 Here’s a breakfast that you might enjoy if you have something of a sweet tooth. It’s vegan, so you won’t have a meaty breakfast slogging you down through the morning. Not to worry because quinoa has you covered in the protein department. Almonds add some extra healthy fats and protein, so these will have you feeling energized for a great way to start the day. The cacao makes it taste chocolatey and yummy while boosting the antioxidant profile. They’re a break from your normal breakfast, and are highly portable. If you enjoy pancakes but don’t really like the idea that they don’t really do anything for you nutritionally, here’s a way to have your pancakes and eat them, too. In addition to the extra punch quinoa is providing here, you’ll also like the fact that these are made with whole wheat flour, and use almond milk to keep them dairy free. The authors suggest you sweeten the pancakes up with agave nectar, but you can use maple syrup or raw honey as a healthier option. The nice thing is that it’s just as easy to make as regular pancakes, as long as you have some cooked quinoa handy. Those muffins you see at coffee shops may be a no-no for their large calorie count and high amounts of sugar, but here’s some delectable muffins you can make for yourself, and they’ll actually be good for you. You’re getting omega-3s from flax, healthy fats from walnuts, as well as all of the fiber, protein, vitamins and minerals from quinoa. This recipe calls for the use of red quinoa, so it’s a good opportunity to incorporate that into your menu if you’ve been avoiding it until now. Don’t let the color throw you. It still has all of the nutrition you’d expect from quinoa. If you love cornbread but don’t have it as often as you’d like because of its rather low nutrition levels, here’s a way to beef it up so you can have it more often. You’ll be getting the flavors that you enjoy because it’s not subbing out the cornmeal, but rather supplementing it with quinoa. 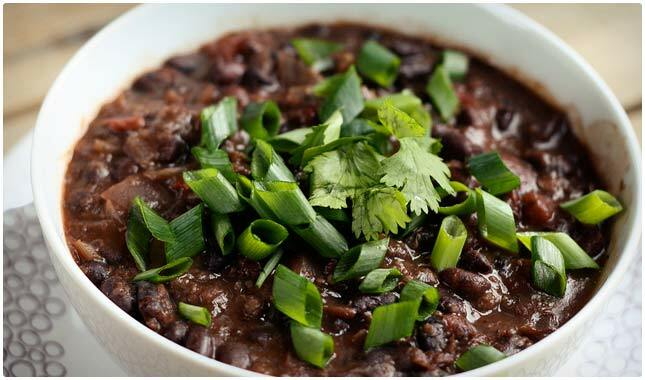 This recipe also uses black beans for extra fiber, as well as additional protein. If you did a nutritional comparison to ordinary cornbread, you’d be pleasantly surprised that this is higher in protein and fiber, and lower in calories and carbs. The maker of this recipe came up for it because it was too hot to make anything else. If you’re in a situation where you really don’t feel like turning on the oven just to have breakfast, here’s your solution. This recipe uses quinoa as a base for other delicious and nutritious foods, namely fruits and coconut milk. This is nice because the quinoa will act as your protein, the coconut milk contains healthy fats, and the fruit will give it sweetness. You end up with a balanced breakfast full of plenty of superfoods, and none other than quinoa as the star. It typically turns out well when you start combining delicious foods that also happen to be good for you. That’s what’s happening here, and this author has figured out a way to take two foods that you might not usually see combined, and bring them together in cake form for you to enjoy at the start of your day. If you’re in a hurry, there’s a microwave option provided, but if you’re having a slower-paced day you can pop this in the oven for best results. The ingredients are simple enough, and with the addition of chia seeds you’re getting a great mix of foods. If you like quinoa as well as rhubarb, then this is the concoction you might have thought of on your own if given enough time. It’s super simple as far as ingredients go, but the resulting taste makes you think it would be much harder. 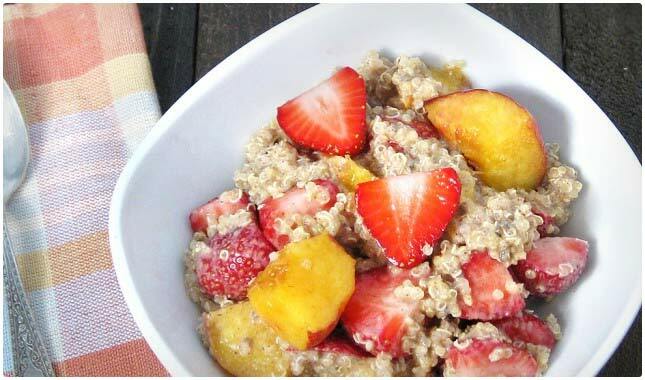 It creates a sort of oatmeal out of the quinoa, although no oats are used. This means that you’re missing out on the trace amounts of wheat found in many oatmeals out there, making this a gluten-free breakfast for you. The rhubarb sauce is something that you could make in larger quantities and keep on hand for use on other foods as well as this. These waffles turn out looking so good you could serve them to your kids and they might not even notice that they’re special. The specialness comes from the quinoa of course, and with the cinnamon and nutmeg present you’re getting the classic flavor of a hearty waffle, packed with the goodness that quinoa provides. Imagine a waffle infused with protein and fiber, as well as being nutrient-dense. It’s not your typical breakfast fare, and you can feel good about serving them to your family. Using organic maple syrup helps to avoid adding high fructose corn syrup to the mix. 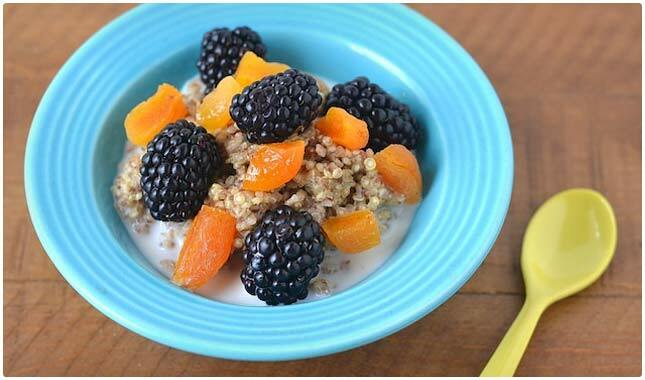 Here’s a simple breakfast bowl that you will surely return to again and again when you want a sweet but healthy breakfast. The chocolate chips and blueberries of course give this a sweetness that is not only popular with kids and adults of all ages, but also has its own value, especially if you use dark chocolate chips. That way they’ll both provide antioxidants. The quinoa is there to give you a host of nutrition all in one bowl. Overall, this will provide you with a nutritional punch, but it won’t feel like you had something this healthy. When it’s lunchtime and you need something easy to make that will get you through the afternoon, quinoa makes a great choice. This bowlful of goodness could become just the thing you turn to, as it has everything you need for a complete and balanced lunch, and even has some interesting modifications to accommodate vegans. Broccoli, tomatoes, and mushrooms combine with quinoa, and there is also some avocado on top so you’re getting a potassium boost and additional healthy fats. Sprouts add even more nutrition, and a bit of lime juice adds extra flavor. These wraps pack a protein punch, which will definitely fuel you through your midday and make it easy to get you to dinnertime. Because they’re using a wrap and not a bread like a sandwich does, you’re getting fewer carbs here and are less likely to have that mental fogginess or crash that can occur after a lunchtime feast. The addition of bell pepper and a cucumber adds extra vitamins, minerals, and phytonutrients that go well with the benefits you get from quinoa. Even the tapenade that goes with this is made from ingredients that have their own healthy properties. You can’t go wrong! Inside each of these well-wrapped leaves is a colorful and nutritious surprise. Because of how well packaged they are, they travel nicely and you can take them just about anywhere you want to go. Bite into one and you’ll remember all of the good things that you stuffed inside of it, like tahini, beets, and a big helping of quinoa. They’ve even managed to incorporate miso paste into these, so you’re getting the unique flavor of miso together with several other nutritional superstars. A feast for the eyes and a powerhouse of healthy foods. Here’s a quick and easy quinoa burger that you might start to favor over the real thing. They’ve topped it with a tzatziki sauce so you’re getting an intense burst of flavor from that, mixed with the savoriness of the quinoa patty. They’ve managed to take some leftover quinoa cakes and repurpose them for use as a burger. If you follow the recipe as shown, you’ll have a side of sprouts with this and use multigrain hamburger bread for the bun. In the end, you’ll have something worth remembering and adding to your regular lunch lineup. If you pair this with a side of steamed broccoli, you’ll really feel good for hours to come. In this recipe, they’re showing you just one way you can use the tomato-quinoa bread they’ll show you now to make. Now you can have something as simple as a BLT and get nutrition that it otherwise wouldn’t have a lot of. Sure, it will have protein and fat from the bacon, lycopene from the tomato, and if you use a leafy green like spinach for the lettuce you’ll have those nutrients as well. But when you sandwich it with slices of quinoa bread, you’re going to be getting high quality protein, and some fiber thrown in as well. This takes any ordinary sandwich and makes it extra-ordinary. Perhaps nothing is more classic than dunking a grilled cheese sandwich into tomato soup for a delicious lunch any time of the year. Here you’re including quinoa in the tomato soup so you’ll get an extra dose of healthiness and a more balanced lunch. The problem with standard grilled cheese and tomato soup is that there’s typically not a whole lot in the way of protein. The cheese will have some, but that is offset by the bread. Here you’re balancing things out much better plus getting added minerals like manganese and iron. These little mini burgers are something you won’t long forget, as they come in handy as a quick lunch, are popular with kids, and are nutritious and colorful as well. The patty that it uses is from a veggie burger recipe that has quinoa as its foundation. This means that no matter else you put with it, you’re starting off with a good nutritional head start. The addition of sweet potatoes and black beans means that this is really doing your body good, as well as tantalizing your taste buds. The best part is that in addition to being good for you, you’re also avoiding a lot of calories and saturated fat by going meatless. This might not look like much at first glance, but that’s sort of the beauty of it. It uses only a few select ingredients known for their rich flavors, that also happen to be healthy. For good measure, there’s a commendable amount of quinoa in it so you’re getting that nutrition infusion that quinoa brings. Try it, and if you like it you may find that you seek out these ingredients at the supermarket each time you go shopping. Add your own name to the recipe and your family will think you invented something new. Separately, quinoa, asparagus, and avocado provide enough benefit to merit eating them frequently, or even daily. When combined in the same wrap, you’re getting a surge of green, but you’re also getting some high-nutrient foods into your system. Asparagus has a prebiotic effect on the body, while avocados provide healthy fats, a good dose of potassium, as well as fiber and carotenoid antioxidants. And of course, quinoa will balance it out with needed protein, as well as additional vitamins, minerals, and fiber. The presentation on this is nice, so be sure to follow the directions so it comes out looking the same for you. These just look yummy, and since they’re so easy to follow you’ll end up with something just as pretty. The combination of chicken and quinoa means you won’t be short on protein, and wrapping it up in a piece of lettuce eliminates the gluten. 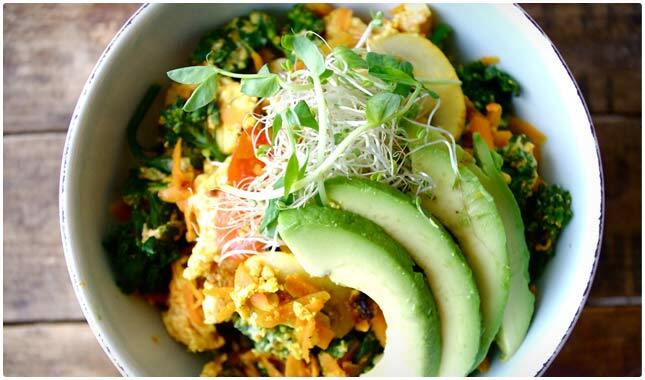 Using mangoes in addition to avocadoes means you’re getting a broader spectrum of goodness. The self-described “Queen of Quinoa” is living up to her name on this one, and you’ll see her creations sprinkled across this page. If you have kids, you’re sure to get their attention with this quinoa creation. Heck, pizza is a favorite for so many people, but unless you do some serious doctoring to it, it’s not very healthy for you. Here is a “pizza” dish that might not look like a pizza, but will still have the classic flavor of one. Replacing the carb-laden dough is quinoa, so you’re taking out one nutritionally void part of a pizza and putting in a winner. The real awesomeness of this recipe is that you can be done with it from start to finish in less time it takes to have a pizza delivered, and at a fraction of the price. These might look like really fancy French bread pizzas, but it’s more of a style thing than a pizza emulation thing. The kale alone would have been enough to send this through the nutritional stratosphere, but they’ve also used butternut squash, which doesn’t get as much respect as it should. Rounding things off nicely is quinoa, providing a bit of texture and really working to hold it all together and make it a cohesive meal. You won’t need to tinker too much with this recipe, as it outlines just what you need and how to guarantee good results. This pasta salad is hearty enough to serve as a main dish, thanks to the value of quinoa. By giving it some southwest flavor you won’t be starved for taste, and the included directions will give you eight servings, so you can feed a hungry family or have plenty for leftovers the next day. This would make a good lunch the day after so you wouldn’t have to worry about that in the morning. In addition to using quinoa, they’re using quinoa pasta as well, so you’re getting a double dose and taking out regular pasta. One thing about putting quinoa into patty form is that it can be a bit dry. They’ve done a good job here of moistening things up with the chickpea gravy. If you really delve into the ingredients here you’ll see that there’s plenty more at play than just quinoa. They’re using turmeric, a superspice with many of its own unique attributes and particular flavor. They also include cabbage, ginger, and potatoes, all of which bring an assortment of tastes, textures, and healthiness to the end result. You won’t have to sell your family on this one too much because it doesn’t really look healthy with the sauce, and is very satisfying. This is a recipe that will definitely fill you up so that you feel like you’ve eaten. What’s nice is that it appeals to a broad spectrum of diets, such as vegan and gluten-free, and it doesn’t contain soy for those looking to avoid it. What it isn’t lacking is flavor, and they’ve made sure of that by using basil, jalapeno, and garlic so your taste buds won’t need a wake up call. The one concern many people have about vegan dishes is whether they’ll feel full when it’s finished. Because of the heartiness of the quinoa, and the pasta form, you can be sure you won’t be hungry again for several hours. Here’s a spicy creation that uses plenty of good ingredients and presents them in a way that will appeal to just about anyone. Fritters is fun to say, and they’re even more fun to eat. They get a nice golden brown crust to them, and they are usually made with potatoes. But they aren’t using any potatoes here, so you won’t have to worry about that groggy feeling you get from starchy foods. Instead you’ve got the broccoli and quinoa working in conjunction with each other, and the jalapeno comes in and kicks things up a notch. The presentation on these is enough to make you want to try it. And when you do you won’t regret it, as they’ll quickly win you over with the uncommon mixture of squash and bacon. The quinoa does its part by keeping everything very nutritious. You’ll get a quality protein to help fill the gaps in the kind of animal protein bacon provides. The author says that you can skip the bacon if you want to make this vegetarian. The cheese would be OK for vegetarians, but not for vegans, but would leave this recipe a bit too one dimensional if taken out. You can be the coolest mom or dad ever when you serve up macaroni and cheese for dinner. You might get a few grumbles when they spot the spinach in it, but if you can get them to try it, they’ll make quick work of it. This is because the spinach doesn’t detract from the experience. You’ll smile knowing they’re getting nutrition not just from the spinach but also from the quinoa, which replaces the macaroni. Maybe they should have called it mock-aroni and cheese, as you’re skipping out on nutrient-poor pasta in favor of nutrient-rich quinoa. These little bites are like standalone meatballs, but without the meat. Don’t worry, you won’t miss it as your mouth gets bombarded with flavors from all different sides. The scallions, parmesan cheese, and mozzarella will see to it that you won’t even notice there’s no meat in these meatball bites. You’ll still get all of the protein you need, including the entire gamut of amino acids. You’ll also be sneaking fiber past your defenses, and in all likelihood will be popping these back just as you would a delectable meatball. The salmon is going to steal the show as far as presentation goes, but it’s only holding its own when it comes to the amount of nutrition piled onto this plate. Contending with the salmon is kale, whose nutritional prowess is just becoming more known by the mainstream. And following all of that up is quinoa, with added protein to go with the protein and omega-3s from the salmon, as well as adding fiber to the fiber you get from the kale. Donkey informed Shrek that everybody likes parfait, and that would have to include this one that uses quinoa where there would otherwise be granola. This means you’re getting a better quality food while at the same time not taking away from your sweet tooth satisfaction. The use of cinnamon, apples and Greek yogurt are a healthy recipe for success. Omit the brown sugar and use maple syrup instead. In order to make it picture perfect as depicted you’ll need to use caramel for the finishing touch, but we recommend leaving it out to cut back on the calories and sugar. It’s not often that you hear the word decadent and healthy in the same sentence, but with quinoa this is about as close as you’re going to get. The use of black beans means that you’re getting additional benefits in the way of more fiber, more protein, and more nutrients. You’ll feel fuller longer with this brownie fudge than you would if you were to just eat regular brownies of fudge, as both quinoa and beans are digested slowly. Plus you’re getting benefits like plenty of protein and fiber that you just don’t get with most desserts. They’ve done a good job of giving this otherwise unhealthy sandwich a nutritional boost by using quinoa cookies. They’re using quinoa flour for these, so the goodness is baked right into the cookies and it won’t detract from the overall ice cream sandwich experience. This makes it gluten-free, so you can enjoy this dessert treat even if you’re on a gluten-free diet. Not many ice cream sandwiches out there are GF, so this makes it a unique dessert indeed. They also provide an alternative cookie recipe if you want to keep the calorie count down, and it is also based on quinoa, so you’re still getting all the benefits. This is a unique twist on quinoa, asking you to used puffed quinoa cereal. This makes it a lot easier because you won’t have to rinse it and cook it. You can simply scoop it out of the box and you’re ready to go. The use of dark chocolate means you’ll be benefitting from the antioxidants it contains, making it a better choice than milk chocolate. Add into that the regular things you’d expect, like peanut butter and regular butter and you’re destined to make these time and time again whenever you need a peanut butter or chocolate fix. This cake is not gluten-free because it is using whole wheat flour. It’s using cooked quinoa, not quinoa flour so it will require a bit of extra work on your part. But that will pay off by providing the nice texture that quinoa has. It’s hard to imagine a chocolate cake that provides you with protein and fiber, but that’s just what this does. Add to that the magnesium and iron that it’s rich in, and you’re finishing your meal with something sweet, but also nutritious, which doesn’t happen often. This one sounds so decadent, so unlike anything that could ever be good for you, that we just had to add it. That’s because for as sinful as it sounds it’s really made with health consciousness in mind, and you can tell by the ingredients that it’s not meant to bust your waistline. It has chia seeds for omega-3s, and the espresso powder will give you a caffeine kick that can actually help you to burn calories, without having to drink a cup of coffee. It’s even using stevia, an all natural sweetener to avoid sugars and artificial sweeteners that can have dangerous chemicals in them. If you like to order fried rice from your local Chinese food shop, this might be one way to make your own at home, without the rice. You still end up frying it, so you get all of the same flavors, and the ingredients list they’ve lined up here is a sure thing. What’s nice is that instead of the common problem of being hungry an hour after eating it, this should sustain you for multiple hours and get you to your next meal with no problems. Mushrooms, eggs, corn, and peas helps to replicate many fried rice recipes, while keeping it healthy. The oranges in this are immediately going to give it a sweet flavor, but right away they’re going to be competing with the zestiness of peppers, and the strength of onions. Add to it some edamame and it really completes itself as an Asian-themed dish. What will drive it home is the dressing, which incorporates more flavors from sesame oil and rice vinegar. 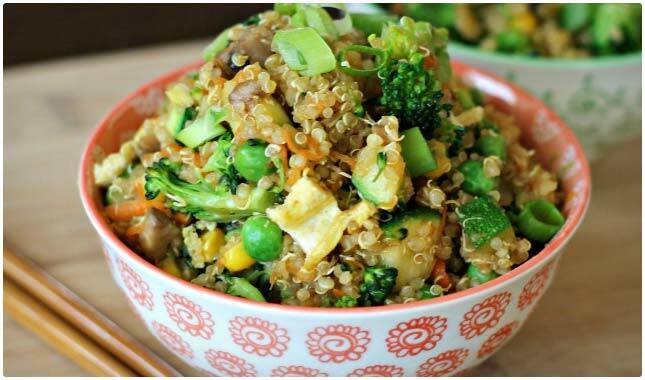 By using quinoa, they’ve given it protein, something that is often lacking in meatless Asian dishes. The quinoa also packs more nutrition than the commonly used white rice. This is one salad you can make an entire meal of. Nothing is more Asian than sushi, and perhaps no other menu item from Asia has had as much success abroad. But sushi is enjoyed in many parts around the world and is viewed as something of a delicacy due to the complexity of making it. Here is a way to make your own sushi rolls using quinoa instead of rice, and using avocado as the main ingredient. The author pairs the avocado with bacon so you’re getting a lot of differences in texture, such as the softness of the avocado mixed with the toughness of the bacon. All coming together for a delicious sushi roll, with more nutrition than your average roll too. If sweet and sour chicken is your go-to when getting Chinese food takeaway or delivery, then you’ll be happy to have your own recipe to follow when you feel like cooking. It’s going to help replicate the experience, but put a spin on it by being baked, not fried, and using quinoa for added nutrition. The accompanying vegetables go nicely together, with vinegar making it sour, and the sweetness coming from honey. Now if you could just find a healthy way to make fortune cookies, you’d be all set. If beef and broccoli is your mainstay, then you’ll have to get your mind around the idea of having it but without the beef. That’s the gimmick in play on this recipe, and a big part of that is by using beefless tips that are specially made for vegetarians. That helps to kick some of the inherent saturated fats in most beef, but it also leaves something of a nutritional void to fill. That’s where the quinoa comes onto the scene, replacing the normal rice and providing a bigger nutritional profile. You may find that you no longer need to order this when at a Chinese restaurant. When they say they’re using mushrooms, they’re not kidding. They’ve used three different types, each of which has been shown to have excellent nutritional benefits. They’ve also figured out a delicious way to enjoy quinoa, by toasting it. When it’s all said and done it’s a rather simple recipe, but the finished product looks scrumptious, and the Asian flavorings offer your tongue new flavors it might not be used to. The quinoa will be infused with the garlic flavor as you saute it, and it’s going to blend nicely with the green onions and mushrooms. Tabbouleh is one dish that many would-be vegan chefs avoid because it looks complicated, or it involves going forth into uncharted territory. If you’ve never attempted it before, here’s a relatively easy way to get your feet wet with it, and to use quinoa instead of the typical ingredient bulger, which contains gluten. There are relatively few ingredients, and the process seems easy enough. This could be made in a quick 15 minutes if you have all of the necessary ingredients. There are a few other dishes that go great with this, and you can make it a themed night by having falafel with it and still be vegan approved. Whenever you add curry to a recipe it’s going to give it a distinctive flavor. This is one stew you could eat with a fork, but you might want to use a spoon to make sure that you get all of the goodness from the different ingredients. The combination of ingredients on this one is pretty extensive, but you might have many of them already in your kitchen, and will only need to buy a few more to complete the set. The beautiful part of it is that they’ve managed to keep it vegan, avoiding all meat and all animal byproducts. Putting avocado and quinoa together is pretty much a no-fail way to make a delicious and nutritious meal, but they’ve added plenty of other vegan-friendly ingredients to the party. The lineup includes corn, parsley, and tomatoes, which really revs up the vitamins and nutrients without using animal byproducts of any kind. What results is a salad that provides plenty of fiber, healthy fats, potassium and other minerals, as well as protein, something that vegans need to be sure they get enough of. It’s also a very filling and satisfying salad that can be a meal by itself. Don’t let the simplicity of this recipe fool you. It has a lot going on! It uses quinoa as its base to make sure that you’ve checked all your nutritional boxes. The use of bell peppers and carrots will give you something to chew on in addition to the quinoa itself, and a simple blend of spices will keep your mouth interested as well. If you’re not keen on the taste of coriander, or cilantro, then you may want to swap out the herb for one you’re more fond of. Overall, there is no meat and nothing made from animals in this recipe. This recipe had us at “queso sauce.” It’s not everyday that you see a vegan recipe proclaiming to have cheese or a cheese sauce, so we had to dig deeper to see how they made it. The cashews were a dead giveaway, and you end up blending it up to a fine creaminess. Jalapenos will remind your taste buds that they’re still alive, and an assortment of other spices will have you in spicy food heaven. Let’s not lose sight of the healthy factor here, with quinoa and black beans providing several similar benefits like protein and fiber. If you like sweet potatoes, then you’re in for a real treat here because they’ve done so much to them that you might never have had them quite like this. The use of spinach is going to go far in making this a healthy dish, but be sure to use quinoa instead of couscous for additional benefits like added protein and more fiber. You’re already getting a fiber boost from the sweet potatoes themselves, and the spinach, but you’ll get even more from the quinoa. For an extra flavor surprise, they have cranberries for that sweet and sour taste you simply can’t replicate. Boom goes the nutritional dynamite on this one. For starters, you have quinoa, which you’ve probably noticed by now is a nutritional juggernaut all on its own. But they’ve gone and put it with Popeye’s nutritional come-up, spinach. Added to that is avocado, so you get a potassium surge that’s bigger than a banana as well as healthy fats that are essential for keeping you full. This is also a fiber-filled meal that will leave you feeling satisfied and clean. Finally, it contains tomatoes, so you’re getting lycopene, and turmeric, which is a spice that has healing properties of its own. Adding southwest flavor to a dish is a sure way to guarantee you won’t be short on taste. Many recipes for quinoa also include black beans, and the two go well together, both with complementing textures, but also a somewhat similar nutritional breakdown. They both are high in fiber, and provide protein. As a vegetarian, you probably are good on your fiber levels, but protein might be something that you have trouble getting. This dish has you covered, and with ingredients like jalapenos and cayenne pepper, you’ll enjoy eating it as well. Quinoa and cauliflower go together like peas and carrots, so it’s no surprise that the author of this recipe paired them for these vegetarian cakes. They say to use ramps, which are wild leeks, but you could probably get by with ordinary leeks if you have those handy. The eggs are what keeps this from being vegan, but there’s just no way around it that we can see. Overall, these cakes provide the benefit of a cruciferous vegetable like cauliflower, plus the amazingness of quinoa. You’ll be filled up, and your nutritional tanks will be filled as well. These peppers look amazing, and when you consider what’s in them, they’re also amazingly nutritious. In fact, there isn’t a single ingredient in this recipe that is bad for you. They each offer than own unqie nutritional makeup, and provide your body with broad range of vitamins and minerals. The presentation on these will make them a big hit if you have company over, and the quinoa can be a conversation starter, since it’s not your usual food. The use of quinoa works really well as a meat substitute, and if you’re used to meat-stuffed peppers, you might not even notice a difference after you’re done eating. These little boats are very cute, and are sure to be yummy as well. There are a good bunch of ingredients all working together here, so you’re getting the unique flavor of turmeric, which provides its own list of health benefits. There’s also tomatoes and cucumbers added. Tomatoes provide plenty of antioxidant benefits as well as help prevent heart disease, and cucumbers are one of the most hydrating foods available. And of course the red quinoa used here runs the gamut on nutritional value, so you get a good meatless meal that lacks nothing. Here’s a quiche that is amped up with the use of quinoa so you’re getting far more benefit than you would from eating an ordinary quiche. The spinach is helping out a lot in the nutritional column, and there is extra protein from the eggs. There are plenty of modifications available so that you can tailor this to your own preferences. For example, instead of using egg whites you can use whole eggs or egg substitute. And if you want to lose the vegetarian classification, you can add meats to it. The big features are that it’s crustless and uses quinoa, so if you tend not to like the crust on quiche this could be your new find. These little bites are different sizes because they’re cross sections of an eggplant. So you’ll get smaller bites from the top and wider bites from the bulge. The use of quinoa to crust these is a smart idea, and instantly adds some extra nutrients, fiber, and protein. The great part is that it’s using three different types of quinoa (flakes, flour, and cooked), so even though crusted makes it sound like it’s only using a little, you’re actually geting a complete serving. You can use mozzarella cheese or you can opt to go with a cheese alternative to stay dairy-free. Portobello mushrooms are a big part of many vegetarian diets because they are given the duty of replacing steak and beef due to their texture and flavor. Here they’ve outdone themselves with a miso glaze, and nested it on a bed of specially prepared quinoa. The hazelnut infuses the quinoa with flavor, which is something that doesn’t have much flavor on its own. Overall, this is a plate that will satisfy you, and give your body a mineral boost. Here’s a vegan and gluten-free stew that you don’t have to spend too much time thinking about or babysitting. It may not be the most colorful dish, as it mostly looks like a bowlful of black beans, but the taste should be just fine. It’s using plenty of contrasting flavors like cinnamon and garlic, so your taste buds will have to figure out what’s going on. The quinoa blends away into the background, but has your back with extra protein and fiber, although the black beans already had you covered. Be sure to grab a lime so you can sprinkle it on top for even more flavor. Chili is great because you can dump all of the ingredients in the crock pot and the longer it simmers and stews, the better it will taste. Come home from work and your house will be filled with the aroma of a delicious meal waiting for you to serve up. It’s also great because it does provide an entire meal in a bowl. Here the combination of chicken and quinoa means your family is getting two quality sources of protein, along with added fiber and minerals. The quinoa goes perfectly with the texture of chili and doesn’t detract from it at all. This recipe is one that you can make whenever you get the notion, and you can make alot of it too, since it makes for great leftovers. It has an ecclectic mix of frozen, canned, and fresh ingredients, so your time is maximized, and the cost is kept reasonable. Dropping it all in the crock pot means you can attend to other matters while your dinner cooks. We like how they’ve added avocado so you get that southwestern flavor as well as additional healthy fats, potassium, and fiber. Their serving suggestion is a bed or tortilla chips, but you can omit this and still enjoy a flavorful dish. Making soup in the slow cooker is a fantastic way to make it, and chicken and quinoa go together great, both in terms of taste and nutritional make-up. The author of this recipe has dreamt up a nice mix of healthy ingredients like celery, onions, and carrots, and brought up the flavor with spices like cajun and paprika. All together, this makes a great lunch, or a hearty starter to dinner. You could even make it the foundation for dinner by adding a few sides to it. While a seemingly simple soup, there’s a lot going on when it comes to nutrition. Lentils and quinoa are always an interesting mix because they’ve both been described as some of the healthiest foods you’re not eating. The lentils offer a carbohydrate that is digested slowly by the body, which means that it doesn’t spike blood sugar levels as much. They also give you a good amount of fiber. Quinoa is also big on fiber, but also contains a significant amount of protein. The use of ginger means that this soup will have a very cleansing effect on the body. But let’s not forget about flavor, with things like cumin, thyme, and cinnamon, you won’t be short on taste. If you’ve missed the taste of an English muffin since you’ve gone gluten free, and have tried in vain to replace it with GF varieties at the store, this could be the recipe you’ve been waiting for. 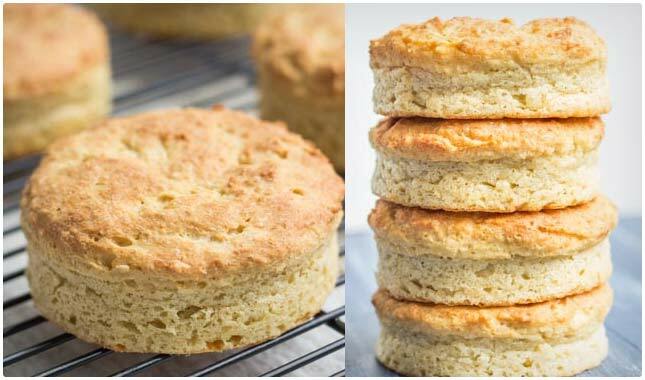 These come real close to the real thing because they’re using an assortment of gluten-free flours, so you’ve got different textures and flavors mixed together. It helps to give it that crevice-filled inside that English muffins are known for, the kind that helps to hold onto the butter, jelly and other toppings that make them so yummy. Here’s a buffalo wing flavor option without using chicken, and without frying. Many recipes call for black beans, but it’s white beans being used here. The trick is that they’re using the same hot wing sauce you’d use for wings, but making the base out of quinoa instead, so you’re still getting protein, still getting a meal that will fill you up, but skipping out on the fat of deep frying. They keep it gluten-free by using the quinoa too, which replaces the typical breading on wings that makes them a no-go because of the gluten. 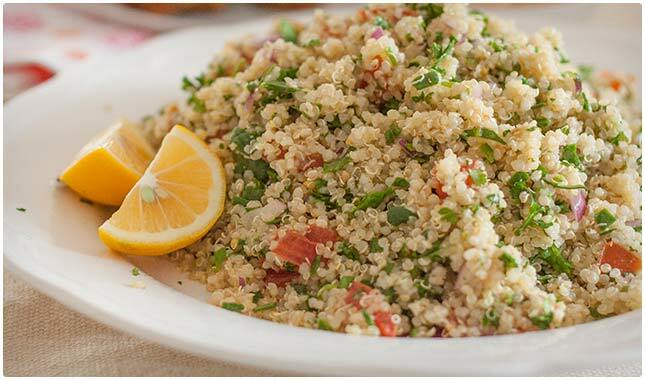 This is a gluten-free salad that is relying heavily on the use of quinoa to give it its substance and foundation. 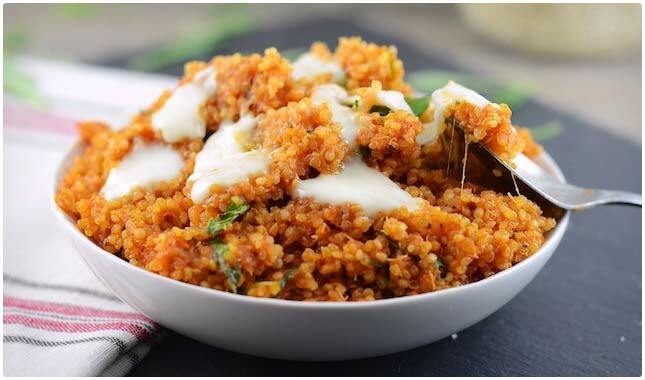 The mixture of different seasonings is important because if you want it to taste Moroccan, you’ll need to help out the quinoa, which has a delicate flavor on its own. They lay the seasonings on pretty thick here so you’ll get an authentic-tasting Moroccan dish, even if you’ve never cooked Moroccan food before. The use of almonds and raisins works to give your teeth something crunchy and chewy to work on. Plus, it adds a bit of sweet and salty. Eating gluten-free doesn’t mean you have to give up the sweet life, and that’s definitely on display with this chocolate cake. They using quinoa to get rid of the gluten found in normal cake mixes. This not only makes it a gluten-free cake, it also means you’ll have additional protein and fiber that ordinary chocolate cake just doesn’t have. The recipe actually closely resembles an ordinary step-by-step for a chocolate cake, except one particular substition that makes all the difference. You won’t have to feel as guilty about enjoying this cake. You can simply revel in the taste sensation. Ordinary granola typically has a lot of sugar mixed in with it, so it’s more natural to use quinoa flakes instead, because then you can be more in control of how much sugar you add to it. Here they give you the recipe, and they let you determine how much and what type of sugar you can use. For example, you can choose between maple syrup, honey, or agave nectar, and also decide in what quantity. We recommend using raw honey made from locally sourced bees for the best nutritional punch. It’s not always easy to keep your blood sugar in check as a diabetic, but quinoa is low on the glycemic index, so it should feature prominently in your menu. Not to mention it’s totally good for you. In this salad, they are using quinoa as a key ingredient, but also taking advantage of the many healthy benefits of avocado. This means that it can be eaten as part of a diabetes-conscious lifestyle so that you can avoid spikes in your blood glucose. If you’ve never eaten quinoa before, be sure to check your levels before and after eating it to see how you respond. Ordinary stuffing is usually a no-go for diabetics unless because of all of the bread. This recipe says you can replace the bread with wild rice, but we like their suggestion of using quinoa instead. It’s presented by the Mayo Clinic as part of a series of diabetes-friendly meals. It’s using mushrooms, cranberries, and celery, so aside from missing all of the breading, it’s covering the other stuffing bases nicely. Plus, ordinary stuffing can’t boast high levels of fiber and the entire amino acids being covered in just one serving like quinoa can. Share this with your family during the holidays and make converts of them all! Risotto is not something that you can usually indulge in as a diabetic, but here is a way to shift it around so that you can enjoy a similar texture and flavor, without worrying if it’s going to cause a problem. This recipe uses a combination of microwave and stovetop cooking so you’re going to be able to whip this up in a jiffy. They are using spinach in it as well, so aside from the healthy nutritional benefits of quinoa, you’re also getting one of the top-rated foods in the world as far as nutrients go. Not too shabby, and a meal that won’t send your blood sugar soaring. This recipe might have just as easily been placed in our Mexican section, but it’s so fast and easy that we had to list it here so you know it won’t take forever to make. Getting it ready and cooking it takes equal time, and you’re out in 30 minutes flat. Helping out the quinoa is broccoli, one vegetable whose nutritional dominance has been established for decades. They’re not using the quinoa to replace the tortillas. It acts as its own ingredient, mixed in the middle with broccoli and cheese. 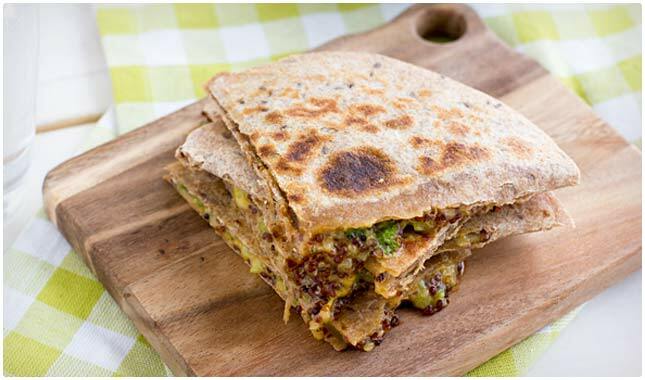 Overall, this provides the quesadilla experience with added protein and fiber and no meat. The claim here is 20 minutes or less, so theoretically you could have this cooked and ready to go in less time than it takes most sit-coms to complete. The end result doesn’t look like it only took 20 minutes, it looks like you spent half the day in the kitchen. But the ingredients are prepped while the quinoa is cooking and the final step is to simply mix it all together and enjoy. This is something you could whip together when you need something quick and simple, but also filling and nourishing. These gourmet-looking stuffed mushrooms are fancy enough so people will think you are a master chef, but so easy due to the liited number of ingredients and step-by-step guidance from this recipe. The best part is that even though they look good and are easy to make, you’re still getting a nice healthy treat here, with the benefits of mushrooms coupled with the nutrients in quinoa, including extra fiber and a surprising source of protein. All it takes is 25 minutes from start to popping these in your mouth. Not bad. You simply can’t go wrong when you swap out turkey for beef, as you’re swapping out a good amount of saturated fat. But by adding quinoa into the meatball mix, you’re also adding fiber, which will help move the meal through your system and reduce blood sugar dumping. You’re also rounding out the protein profile of turkey with another high quality protein and all of your amino acids all in one place. And who could forget spinach, the quintessential healthy food that we all know we should be eating more of. This recipe might just have you eating it on a regular basis, since this should take about 40 minutes, with the bulk of that baking time where you can go do other things. Here’s a meatball recipe that ends up making patties out of them. You’ve got the quinoa mixed right in with the beef, so this is really easy to put together, as there’s not a lot that can go wrong. You just mix the main ingredients, flatten into patties, and cook them up. The quinoa acts to balance out the beef, and you’ll end up getting a big protein kick from this meal, making it a great post workout meal. The total time sould clock in at 30 minutes. These tacos are not really like any other tacos you’ve probably had, and that’s OK, because it’s always good to try something new, especially if it uses quinoa. The BQC stands for Beans, Quinoa, and Cheese, a triple combo that can’t miss. Call it the Big Three of healthy Mexican cooking. You’re sure to be filled up and have a flavor overload because this is using feta cheese, not your typical cheese when making Mexican food, but that’s what cooking is all about, pushing the limits and exploring new flavor combinations. These poblano peppers will definitely turn heads when you serve them, and once your guests or family find out that it has quinoa on the inside, they’ll either be curious or delighted depending on their familiarity with it. The different ingredients she’s using are spot on perfect for this kind of recipe, and it will be spicy, but not so spicy that you can’t taste all of the flavors or that it becomes uncomfortable. The beauty of incorporating quinoa into Mexican dishes is that you immediately give the meal a nutrition upgrade without taking away from the taste or texture. Here’s a Mexican dish that basically is Mexican rice with quinoa subbing in for the rice. The fact that they’re showing you an easy way to make quacamole to serve with this is a nice touch, and one that will make avocadoes that much more tastier. So let’s recap: you’re getting delicious quinoa that’s soaking up all of the flavors from the spices and vegetables, and then you’ll cool things off by topping it with guac, where you’ll get a shot of potassium and healthy fats to really round out this meal. 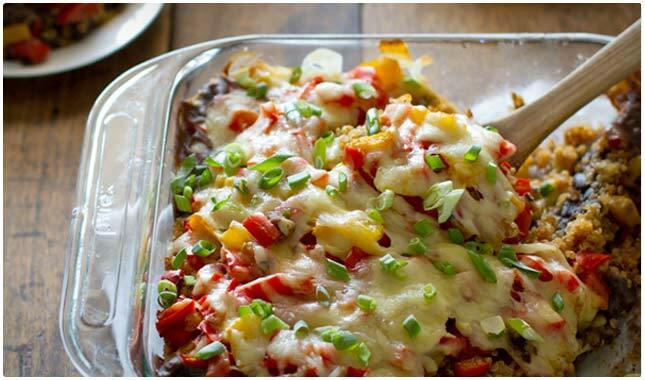 If you like your Mexican food spicy, this is the casserole for you. They’ve kicked it up a notch with red pepper flakes, cayenne pepper, chili powder, and cumin, and that’s just the spice breakdown. There’s also jalapenos so you know you’re going to feel the burn on this one as they all cook together and pass along their different seasonings. You’ll notice that quinoa features prominently in this casserole, providing the bulk of the meal, so you’re mostly getting a big block of nutrition, with the same sort of spices that you’d expect from a Mexican meal. Very satisfying! These are the cutest little muffins, and they’re made to taste a bit spicy, so they’re not your ordinary muffins. And of course, they’re made with quinoa, so they’re definitely not ordinary. You’ll be getting a good serving of protein, and not just any protein, but all of your amino acids in one muffin. Also, the fiber in these muffins will help to keep your system regular. They have a vegetable of your choice in there as well, so you can really doctor this to your own preference by putting your favorite veggie, or one that you’re trying to eat more of. These wraps are a great way to get that Tex-Mex taste without worrying about whether or not it’s going to effect the readout on the scale. That’s because you’re subbing out the wrap for any bread, and you’re getting both chicken and quinoa, so it’s heavy on the protein, light on the carbs, and contains more protein than a sandwich ever would. This makes it a great lunchtime grab when you’re on the go, and it keeps well so you can make it in the morning and enjoy it at your lunch break. Be sure to cut it in half as shown so you can see all of the amazing layers there are to this. Here’s a meatless treat that will leave you wanting for more. That’s because there’s no nutritional or flavor gaps left. They’ve got it all covered. It’s also a well balanced meal due to the ingredients they’ve chosen. 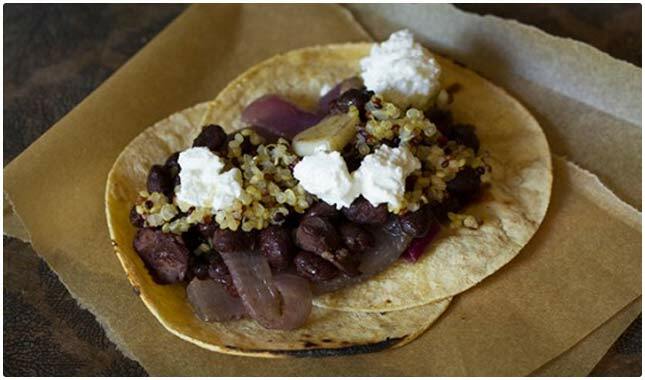 The black beans instantly give it credibility as a mexican dish, and the quinoa is there to provide the texture and flavor of ground beef. The corn helps out a bit with some added flavor but really these don’t need it. What you have here is a well rounded meal, especially if you top it with cubed avocado and get your healthy fats and added potassium. Mango salsa is always a nice change from regular salsa, providing a sweet fruitiness that is often lacking in Mexican dishes. Here they’ve figured out a way to take mango salsa, add some quinoa to it, and make a salad out of it. The ingredient breakdown is simple, including just a few spices, but you won’t be left short on the taste, and this is dish you could make big quantities of for family gathering or office potlucks. The best part is that because of all the quinoa being used it’s going to register high on the healthy scale. Here’s another recipe where they’re using the concept of giving chicken a nice quinoa coating. The benefits are that it’s going to make the chicken taste better, giving it that baked or fried chicken flavor, the crunchiness and the texture, but without having to use a flour coating or bread crumbs. She’s paired this up with a honey mustard sauce so you can feel like you’ve ordered the chicken fingers from your favorite restaurant, without all of the fat and calories that come with them. You can pair this with any vegetable and have a complete meal due to the protein, carbs, with extra nutrients from the veggies. Chicken and quinoa are always a good mix, and when you’ve got an assortment of roasted vegetables along with them, you’re in for a good time. This is a pretty basic recipe in that it is simply chicken resting on a bed of quinoa, but it is the details that help this along, such as the wine glaze that goes on the chicken, and the way that the author prepares the roasted peppers. You’re going to get massive amounts of flavor, as well as protein from the chicken and quinoa dynamic duo. 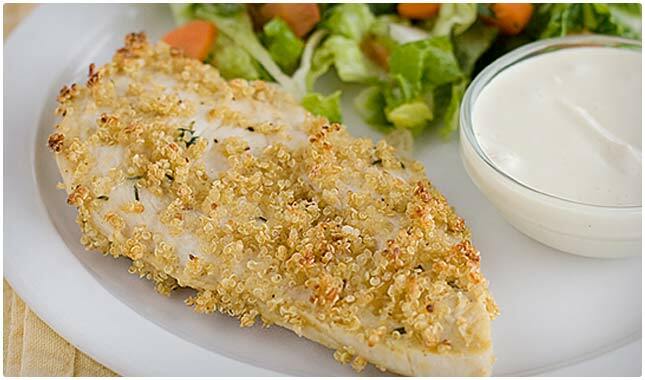 Here is a unique way to use quinoa, putting it in schnitzel form and mixed with chicken. You can make a chicken schnitzel, but that is somewhat unifaceted and by adding the quinoa you are giving it more texture and able to make more uniform patties from it. There is also chives added to the mix, so you’ll get a nice flavor throughout. Here’s a tasty chicken recipe that is using quinoa instead of rice or other sides. It is providing a Mediterranean flavor profile so you’re getting some spices and seasonings as well as vegetables that you might not be used to getting in your regular weekly menu. The use of cucumbers is going to help hydrate the body, and cumin is a spice that is widely regarded worldwide as having plenty of health benefits all its own. When eating all of these foods together you are giving yourself a broad number of vitamins and minerals. This recipe probably will replace whichever one you go to for chicken parm. That’s because they’ve wisely used quinoa to give it that classic crunch, while also providing the health benefits it has. You can make this dish gluten-free by using a gluten-free flour in place of white, enriched flour. What you’re left with is a chicken parmesan that you won’t soon forget, and since it’s healthier than most of the recipes out there for the same dish, it’s one that you won’t mind keeping around. Replacing breadcrumbs with quinoa should also have this clocking in at more protein and fiber as well. Quinoa with chicken is the name of the dish here, and as you might have noticed by the title it’s going to have a Spanish feel to it. The dish has a beautiful hue once you’re finished, and is really appetizing. The cooking process itself is easy to follow along with, and the list of ingredients alone will have your mouth watering. Imagine the flavor combination of the spiciness of paprika and cayenne pepper, with the frutiness of grapes, mixed with the savoriness of the vegetables. All the while quinoa is the main attraction, along with chicken, giving you a healthy dish you can rely on. If you’ve been trying to give up classic game time foods but really miss your buffalo wings, here’s a way to do it with the least amount of guilt. That’s because there’s quinoa baked right in. She had the great idea of using a mini muffin pan so that you don’t have to worry about them coming out the wrong way. Down to the last details this author even has the classic blue cheese dip, but made with Greek yogurt so you don’t have to feel bad at all about any of this. It’s fast and easy recipe you can assemble just minutes before the game and beat the clock. This bowl has everything you need in it for a well rounded, healthy, and satisfying meal. You can enjoy this for lunch or for dinner. Eaten at lunch, you’ll cruise on into dinner time. Eaten at dinner it will make you feel great until bedtime without giving you that overfull feeling. They’ve done everything they can to make this a complete meal, as you’re getting your protein met by both the chicken and the quinoa, and you’re getting a nice mix of vegetables for a wider range of vitamins and minerals. Here’s a healthy dish that keeps things clean and goes back to our grandparents ways. While quinoa is not approved on the Paleo diet, the rest of this breakfast recipe keeps you fed with foods that you’d be able to find even if there were no grocery stores or farms to speak of. All of the main ingredients are in the title, and it’s simply chunks of stawberries and peaches nestled next to some quinoa with a few added seasonings. This helps you eat clean, feel good, and give your body protein from the quinoa. Eggs are a go-to item when you’re trying to eat healthy, and luckily they play well with quinoa, especially in this fritters recipe. The corn, shallots, and jalapenos are all items that would grow fine in the wild and need very little processing to make it into the recipe. These nuggets are going to score big with you and may even win your family over to your healthy way of eating. The ingredients are simple enough, but it’s the method of which they get such a great coating of quinoa around the nugget. This beautiful salad keeps things simple. It’s truly a healthy salad, using spinach and beets that can be pulled right from your garden and quinoa that requires very little in the way of processing before it can be eaten. If you’ve been looking for a healthy salad to accompany your main meals, or a light lunch or dinner option, this may be one way for you to go. Spinach and beets each have their own high nutritional values, and quinoa is our main focus on this page, and will top you up on several deficiencies if you have them. Almonds are nuts, quinoa is a seed, so this is a very healthy dish. It gives you a nutritional kick in the pants as you’re getting all of the healthy fats that almonds contain, plus all of the fiber and protein that quinoa contains, so this is a recipe that can have you feeling really good for a good amount of time. Here’s recipe that contains an unusual ingredient, and matches it with an exotic ingredient, and we’re not even talking about the quinoa. The use of squid here might turn you on or off depending on your feeling on calimari and squid in general. 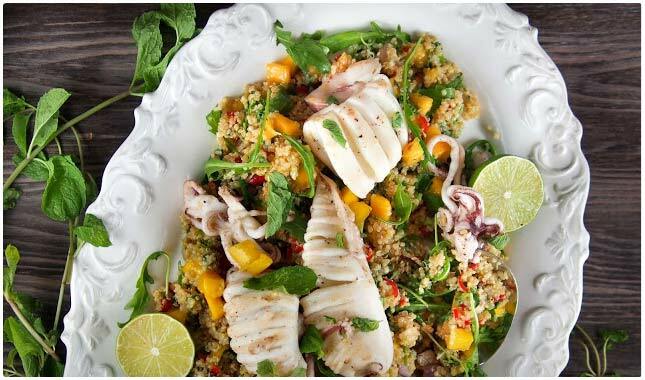 There is a good amount of mango used as well, so you’re getting the sweet taste of mango, juxtaposed with the corriander and mint, all the while there’s grilled squid for your taste buds to figure out. The quinoa acts as a support for all of these ingredients and flavors. Of course we couldn’t have a list like this without showcasing a salmon recipe. Salmon and quinoa go together quite well, and are a good nutritional yin and yang. The salmon already packs a lot of protein, and of course it is known for its omega-3s. The quinoa will round out that protein with all eight of the amino acids the body needs, while providing much needed fiber, as well as essential minerals the body needs daily. To boost things to the next level, they’ve added spinach, a nutritional truckload all its own, and mushrooms for added flavor and nutrients. Here’s a way to incorporate quinoa into a dish that would otherwise have used rice, or couscous or some other bedding. It’s basically a fillet of salmon resting on a bed or quinoa, and sometimes that’s all you have to do in order to start using more quinoa. Just start replacing other foods that aren’t as nutritionally sound with it, and you’ll be all set. The special part about this recipe would have to be the vinagerette that they have for it, giving the salmon a nice color and flavor. Using wild salmon means you’re avoding a lot of the additives that can be found in regular salmon. If you want a taste of down south cajun cooking, nothing will get you there quite like crawfish. Here they’ve kicked things up a notch so this is going to clear your sinuses a bit. These cute little cups are stuffed with crawfish, quinoa, and hot sauce, and they come out all bite sized just begging you to eat them. The wonderful part about quinoa – aside from it’s nutritional offerings – is that it goes well with just about anything, and what you’ll mainly be tasting here is the spicy crawfish and crust of the cup. Is bacony a word? Our spellcheck doesn’t think so but it makes sense when you’re talking about a bacon-infused quinoa that is the nesting spot for scallops like these. Notice that they’re using fresh and locally bought seafood. That may or may not be a possibility for you, but try to get the freshest ones you can, either from a specialty shop or by asking at the grocer when they got a shipment in. It’s crucial when cooking scallops to use fresh ones for best results. This is a wonderful creation that gets you all of the protein, fiber and extra minerals you need. If you can pull off the presentation on this one you will forever cement yourself as the family chef, or you’ll impress your date to no end. By using halved pineapples you’re serving this up using the food that it contains, which is always a good way to go, presentation-wise. Frying up quinoa with pineapples and shrimp is genius, so even after the novelty of the presentation wears off you’ll still be reveling in the taste. The spice breakdown alone is impressive, but the ingredients steal the show for being superfoods in their own regard. The best part? 40 minutes from start to finish, so you won’t have to be in the kitchen all day. This list should keep you busy for awhile so be sure to stock up on the quinoa now that you know you won’t be short on ways to use it. Of course, you can use your own noggin to brainstorm ideas and ways to start using quinoa where you’d otherwise be using rice, potatoes, or some other side dish that doesn’t pack the same nutritional punch. If you know of any quinoa recipes that deserved to be on this list, please add them to the comments below. Thanks for including my Quinoa Fried Rice! 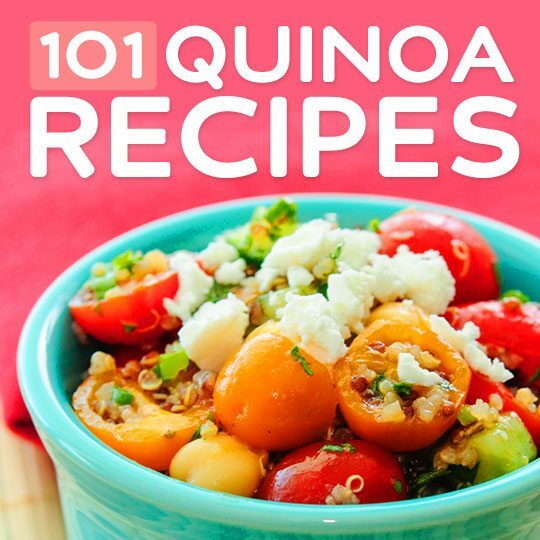 This is the motherload of quinoa recipe roundups! I am on a very restricted diet right now, but I can have quinoa, veggies, spices and not a lot else. This list has given me SO many great ideas. Thank you for making my life easier! !